My son's birthday party was canceled due to illness. Yuck. 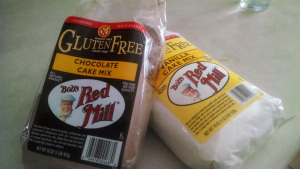 Sitting on my counter were two sad bags of cake mix that I had purchased for the party. I probably shouldn't have made them for sick people, but I couldn’t just leave those lovely packages of cupcake mix alone. I know they were supposed to be for the canceled birthday party, but they looked so yummy! I had to try them! I must have done something wrong. It took over an hour to bake one small tray of cupcakes. I did manage to finish two trays, but that is only 12 cupcakes and it took me about 4 hours. Perhaps I am angling it incorrectly? Additionally, I am having trouble with the black towel that I use over the cupcake tin getting batter on it. Does anyone know a way to correct this?